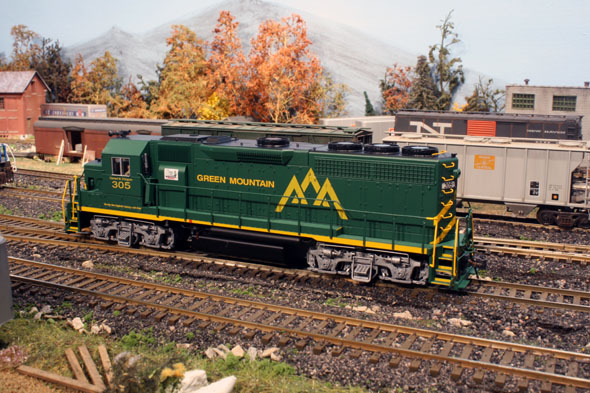 Green Mountain No. 305 has a really nice looking paint job with some details included. Some of these details need to be applied by the modeler. 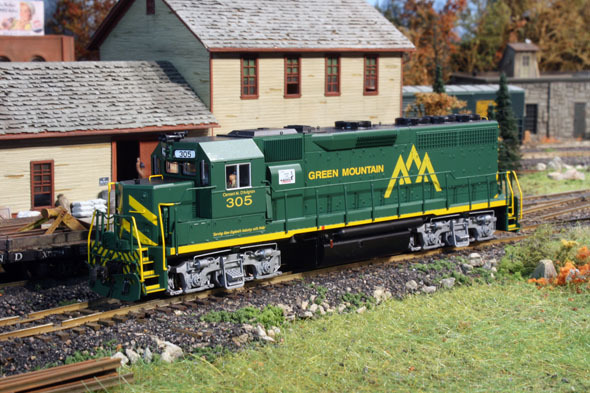 GM 305 is holding down the local switching for now at Bellows Falls. I did not notice it till Peter pointed it out, the headlight is mounted between the number boards but should be on the lower nose. If one looks close they got the stripe paint right leaving an area for the headlight...something I will have to look at changing. On this model I added the end rails and plow. I changed out the couplers with Kadee true scale 158's. From the front entrance of the main structure one can view the CP RDC car. I took the trolley ride around the park. This car is a real treat to see and the interior was in great shape. As one enters the grounds the main structure is straight ahead. This is a newer modern building which will keep many of the better pieces from deteriorating. The ticket office at the main entrance to ExpoRail. More storage cars to model. There was a lot more to see that was not accessible on our visit. Hopefully at some point this other equipment will be restored and on display. 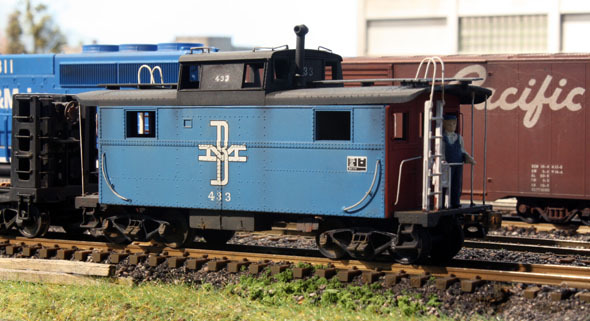 The decals used are from a Micro Scale B&M diesel set number. The paints used are all Floquil colours such as grimy black, B&M blue (a jar I recently found at a flea market unopened.) and a mix of caboose and signal red. Summer time operations on the WRD has my contemporary fleet in action. 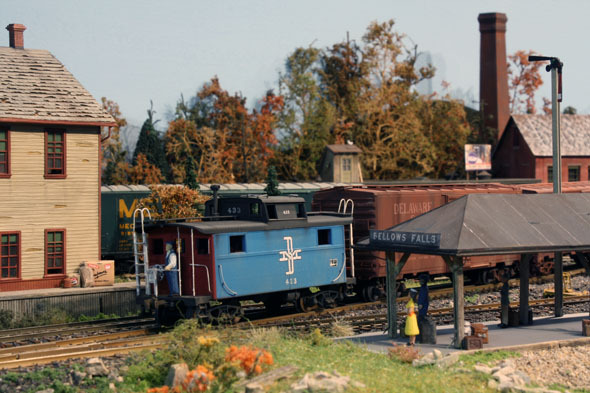 My new Bowser model is at the tail end of a short train in the Bellows Falls yard. As mentioned before this little diorama was built to display my small collection of unused steam engines. 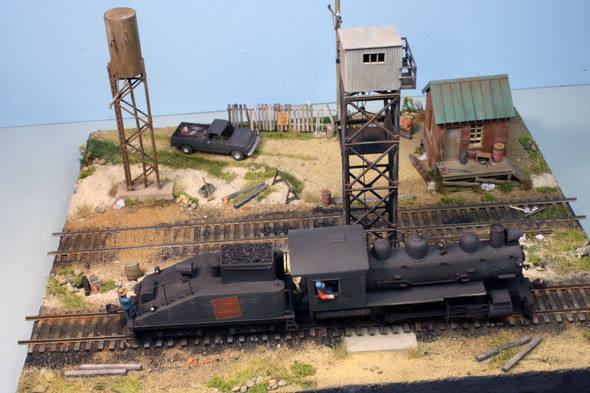 The main power for my Randolph yard switching layout now has a placen to rest during retirement and of course to dump its ashes. 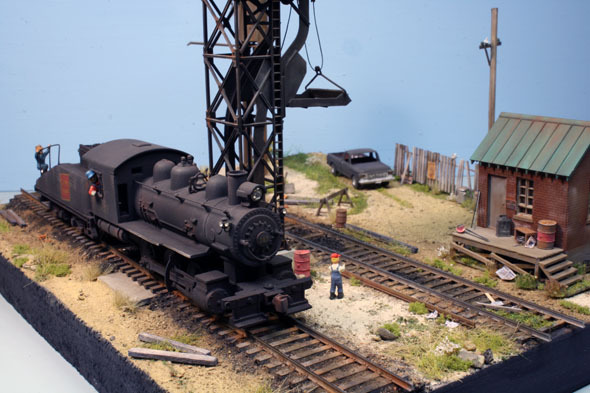 This cast metal engine has a few additional items added over the years. A few years back it got a dusting of Floquil grime and some Bragdon powders. An overhead view. Not an exact copy of a CV switcher but for the era a good stand in. I have CV brass etchings and an 0-8-0 DCC with sound ready to go for a better rendition of a CV switcher...just need to find the motivation to begin the project. GEXR power at the repair facilities in Goderich, Ont. The shop employee was very helpful regarding current operations. George was on the 'phone - something about needing to make a quick trip to visit his sailboat at the marina in Bayfield. A leaky fitting in the keel area was necessitating a bailout every three or four days. Sky conditions tomorrow were supposed to be favourable for photography, and if I wanted to go along, we could go by way of Goderich and hopefully catch the train coming into town. This certainly piqued my interest - it sounded like my kind of sailing! 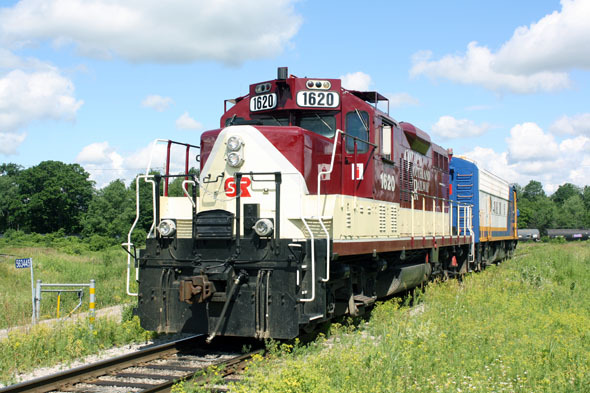 The Goderich Exeter Railway (GEXR) is really like two railways in one. 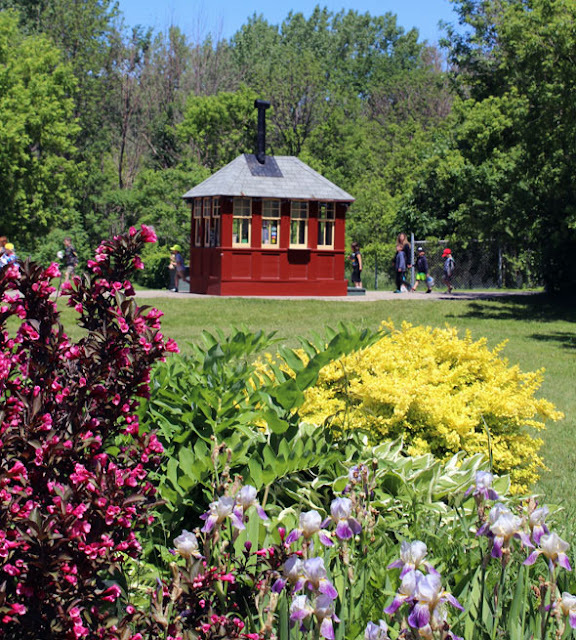 It's mainline, the Guelph Subdivision, stretches from London to Georgetown by way of Stratford and Kitchener. 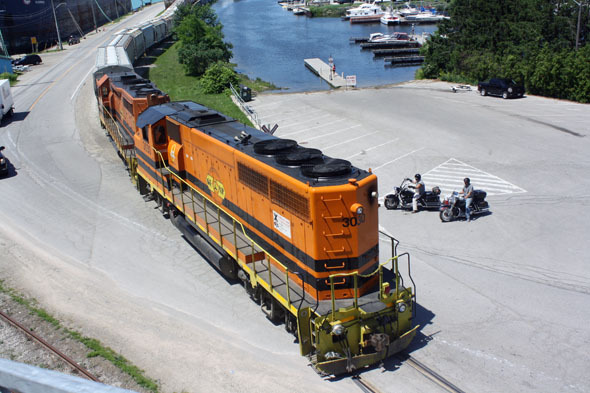 From Georgetown, CN trackage rights allow GEXR freights to access Toronto's MacMillan Yard. 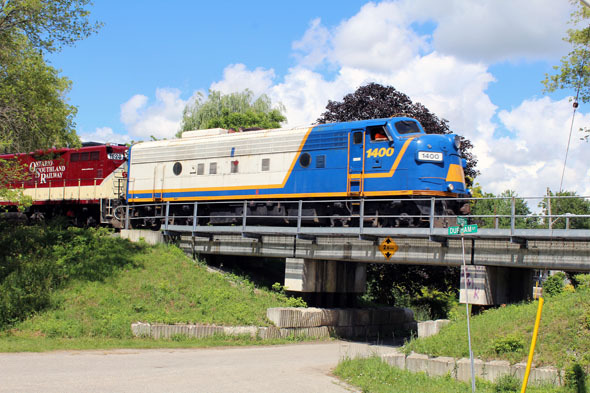 The Guelph sub is shared with Via and GO trains, along with occasional detouring CN freights, so it can be a busy piece of track. On the other hand, the Goderich subdivision and the Exeter spur are quiet branchlines, normally hosting only one train at a time. Most days a train leaves Stratford in the morning headed for Goderich. With only sporadic forays down the Exeter line, the train normally returns to Stratford later the same day. If the crew runs out of time, the train is simply tied down wherever it stands, and the crew is taxied back to Stratford. 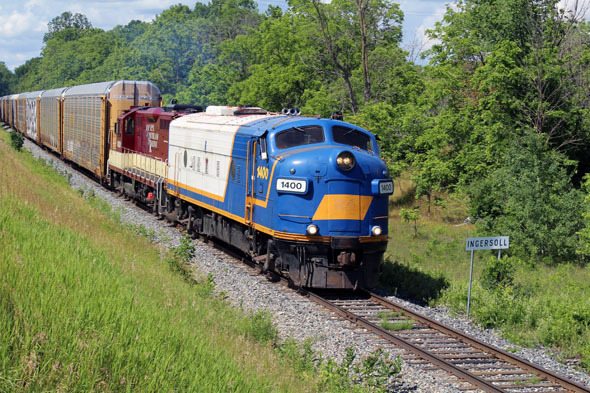 Our route towards Goderich started out running parallel to the Exeter spur from Centralia to Clinton. We checked the line in several spots, but saw no sign of power laying over. Our first actual stop was at Clinton Junction. This is all "dark" territory, so a headlight or distant horn sound was all we would have to go by. 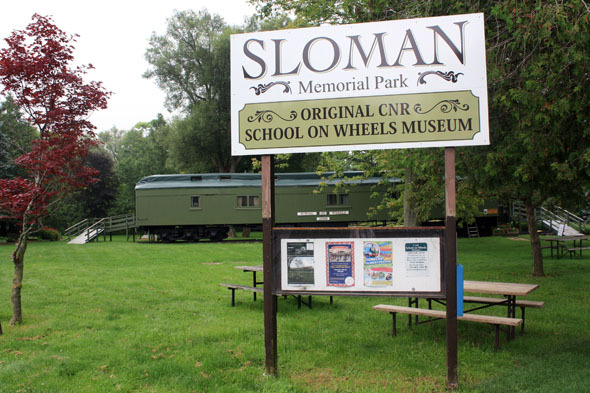 With no evidence of an approaching train, we backtracked a bit to visit Clinton's Sloman Memorial Park. This is where CN 15089, a former "school on wheels" car, is situated. Starting in 1926, the Ontario government operated seven such cars in remote areas in the north of the province. The last such car operated until the mid-1960s. 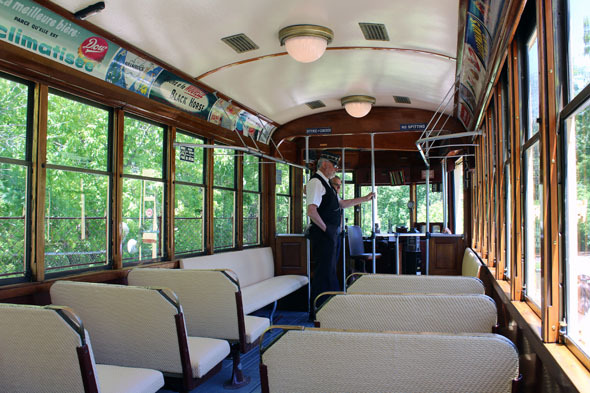 The cars would be parked on local sidings for a week at a time, and students of all ages (adults included) would come out of the woods to attend classes. At the end of the week they would be left with enough home assignments to get them through to the car's next visit. Clinton native Fred Sloman spent 39 years living and teaching on these cars on a route that stretched from Capreol to Foleyet on the CNR. George and I were not able to get inside the car, but through an end window we could see the classroom end of the car. Fred and his family would have had living quarters in the opposite end of the car. 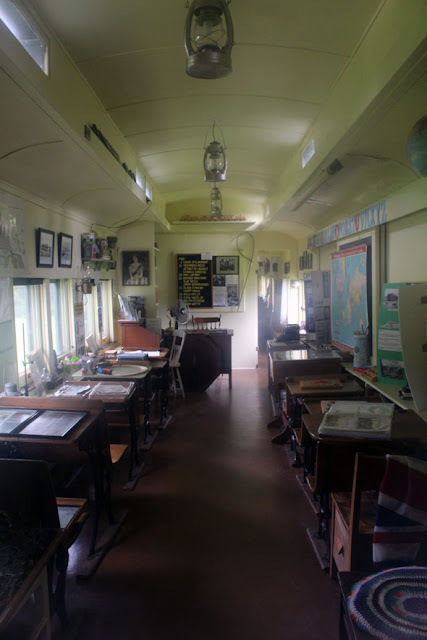 The interior of the school car as seen through the doorway window. With a couple of stops to check out potential photo locations, we soon arrived at the GEXR yard in Goderich. 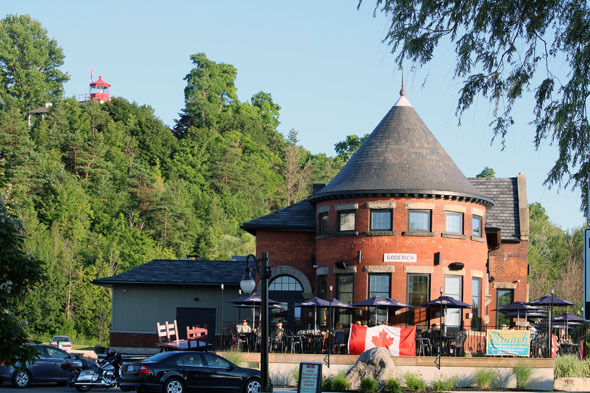 This flat area is situated high on the bluff overlooking the harbour on Lake Huron. GEXR has a single stall shop in this location where indoor and outdoor repairs are carried out on company motive power. Four units were in evidence at the time of our visit. 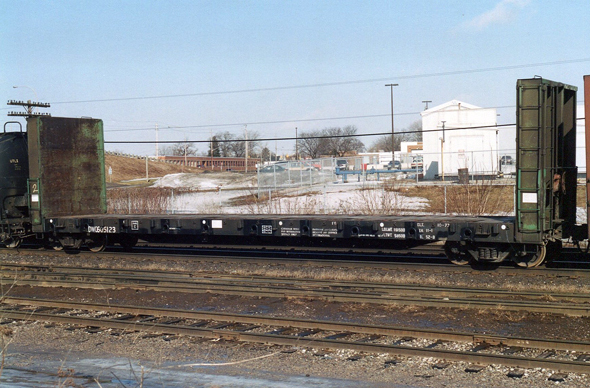 Two units were still dressed in faded versions of the paint of previous owner, Rail America. These were GP40 4095 (ex-CN 9304/4004) and GP 35 2211 (ex-CP 5010/8210). 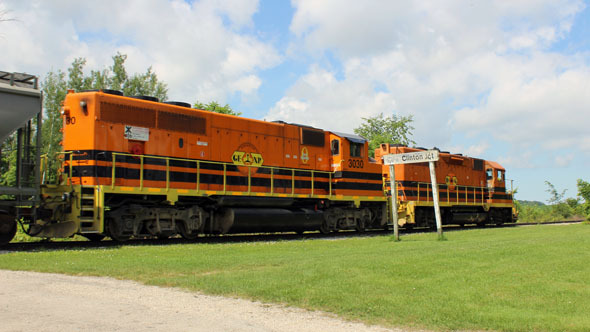 Since GEXR is now a Genessee and Wyoming property, the other two units wore the familiar black and orange. They were GP-39C 2303 (ex-CSXT 6591/B&O 4016) and SD40-2 3393 (ex-GATX 7362/MP 3176). 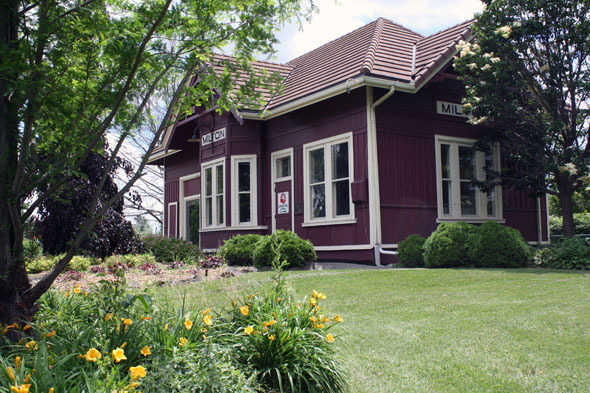 After checking with a GEXR employee and discovering the the train was still likely an hour or two away, we left for a short tour of the town. 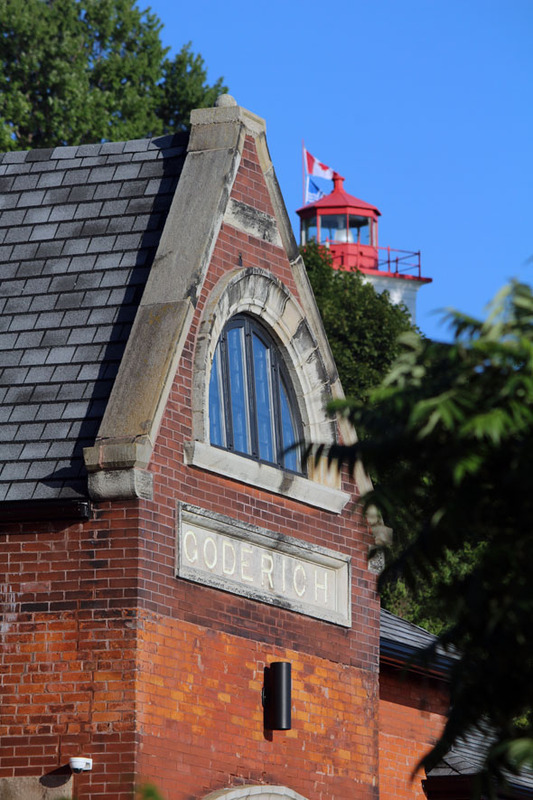 Self-promoted as "Canada's prettiest town," Goderich features an octagonal downtown area with streets radiating out like the spokes of a wagon wheel. The core area is vibrant and attractive, with a mix of older and newer structures, although the newer buildings follow classic lines. The first time visitor could be excused for not realizing the devastation that had occurred in this area on August 21 of 2011. On that day a powerful tornado blew in off Lake Huron, damaging or destroying 25 structures in the downtown area along with 100 homes. Thousands of mature trees also disappeared on that day. It is a testament to the resilience of the local citizenry that the town looks as spectacular as it does after a scant six years. 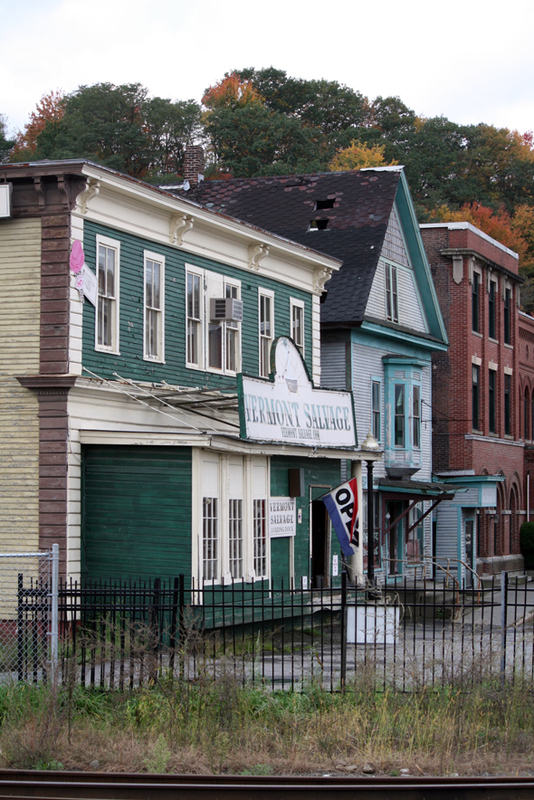 While making our tour George indicated there was one structure his car simply could not drive past - the local bake shop. Apparently summer Saturdays find potential customers lined up outside the door, but on this weekday morning we were able to enter unimpeded. A few minutes later we were making our exit with a box of cream-filled donut delights. Oh how my dietician would cringe! 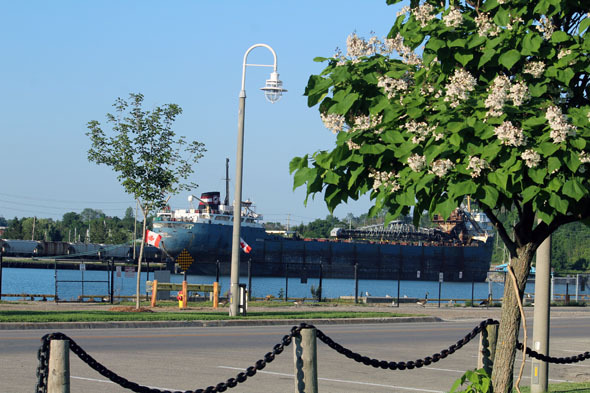 Near the ex-CPR station and along the waterfront is this line of Catalpa trees in full bloom. Similar trees are located at Clinton Jct trackside, but well after flowering season...a location that could make a great scene in future visits. 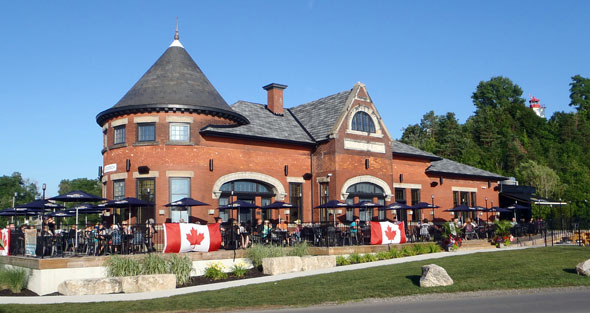 The next stop on our tour was at the waterfront where I had my first look at the ex-CP brick station which had been relocated closer to the beach and converted into a restaurant. George has already shown you pictures of this very successfully transformed building. 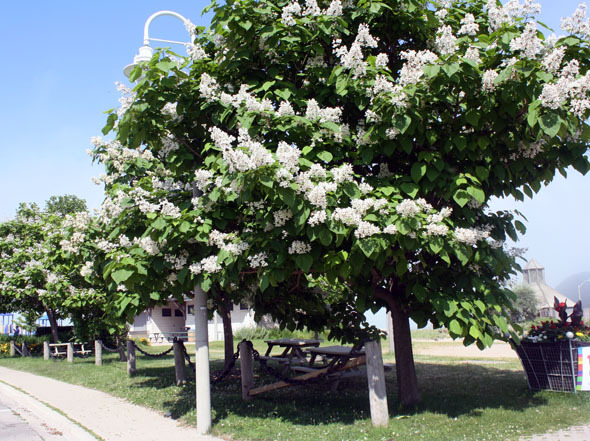 Across the street was the municipal waterfront park with its beautiful group of flowering catalpa trees. A shaded boardwalk takes visitors a couple of kilometres along the well-kept beach and through the municipal park area. Spectacular! We had to tear ourselves away to go train chasing! 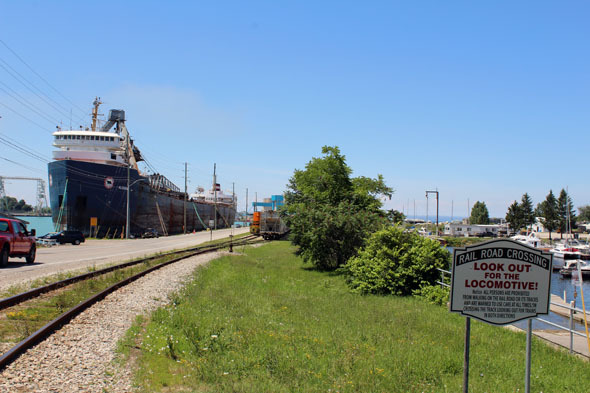 After a short wait the Goderich bound train arrived at the Clinton wye which is called Clinton Jct and the connection to the Exeter Sub. This area has some nicely cut grass with brush cleared out on both sides of the track courtesy of a property owner at this location. We headed back the short distance to Clinton Jct. Here was a quiet shaded area where we could wait and listen for the approaching train. We had a conversation with a local property owner, who informed us that the train had yet to pass. He had another impressive grove of catalpa trees, this one right near the right of way. Unlike the trees down the road in Goderich, their blossoms had already come and gone. Mental note to self - if ever in this area around the first of July, head to Clinton Jct. Those trees would look great in the foreground of a GEXR photo! Once the friendly property owner left, we barely had time to enjoy a donut before we heard the train whistling for the level crossing in Clinton. Today's train was headed by QGRY GP35 2500 (ex-SP 7724) with GEXR GP40-2LW 3030 (ex-CN 9431) in the trailing position. 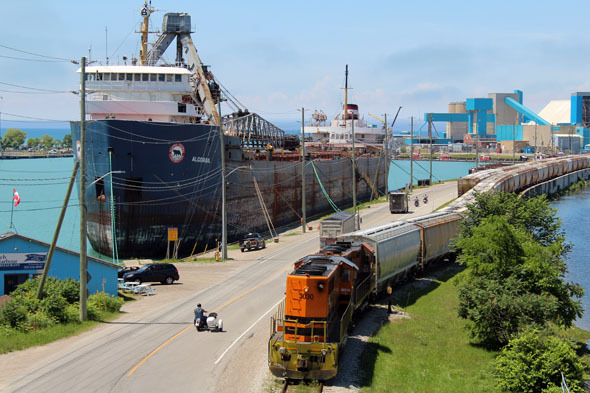 We were able to get ahead of the train and photograph it twice more before it arrived at the Goderich yard. Here a few cars were shuffled around before the power ran around the train and got ready to shove the cars down the grade towards the waterfront. 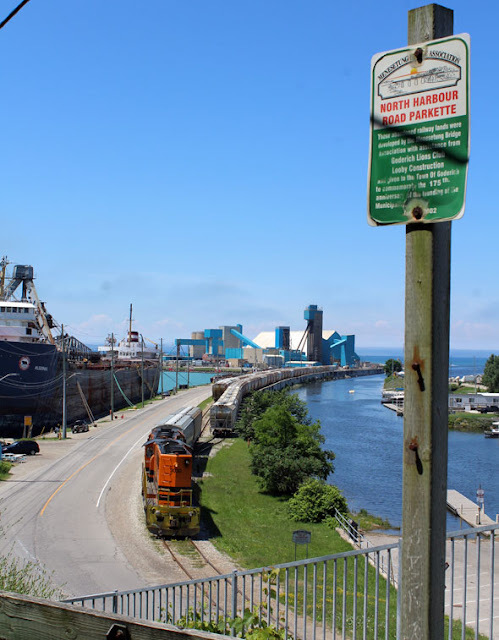 This hill is one of the steepest railway grades in the country, and leads directly onto a long pier which juts out into Lake Huron near the mouth of the Maitland River. Here is located the principal raison d'être for the entire Goderich branch - the Sifto salt mine. We got ahead of the train after leaving Clinton arriving just moments before the train arrives at Holmesville. This salt mine is the largest underground salt mine in the world - and not just under ground, but under water. The head frame is located at the end of the pier, but the mine itself drops 530 m below the surface of the lake and occupies an area of over seven square kilometres. The two spur tracks on the pier are already close to being full, so the cars of today's shove have been counted carefully before the units started to ease the empties down the grade. 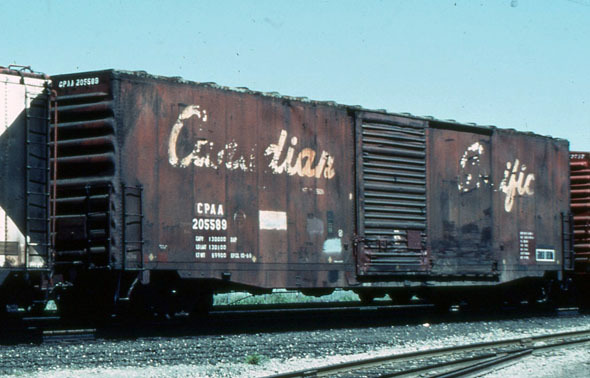 Because of the corrosive nature of their lading, the covered hoppers used in this service exhibit very noticeable weathering patterns. After these cars were carefully fit into the north spur, the units got ready to drag their lift back up the hill. Talk about sound and fury - those two aging GM units put on quite a show! We followed the train back up to the yard. Then it was time to point the PT Cruiser toward Bayfield. George had a job to do, but fortunately he had beer in the fridge. While he bailed, I imbibed - what a civilized set up! After the pails were dumped there was just enough time for one more donut before we headed for home. A crew member rides the lead car down to the salt siding protecting the crossing along the way. Peter and I found this nice vantage point called the North Harbour Road Parkette. At the crossing there is a nice sign that can be worked into ones photos. The GEXR is seen tucked back in lifting the loads. 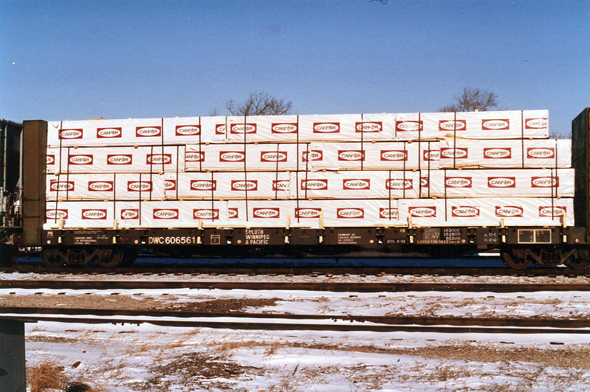 The GEXR crew sets the empty salt cars over before grabbing six loads. They will hold onto two grain loads for this move. This location is maybe the best spot to catch the action at the salt mines. There even is a bench for one to rest between moves. 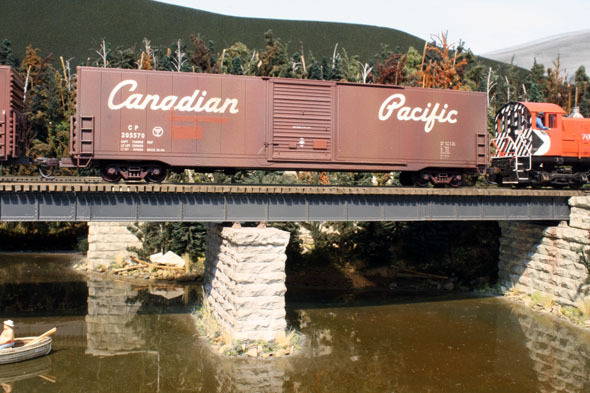 Our first train of the day was this eastbound CN freight, shot under the eaves of the former Ingersoll station. Lead unit is ES44AC 2886, with ET44AC 3055 trailing. All images included in this post were made on June 26, 2017. 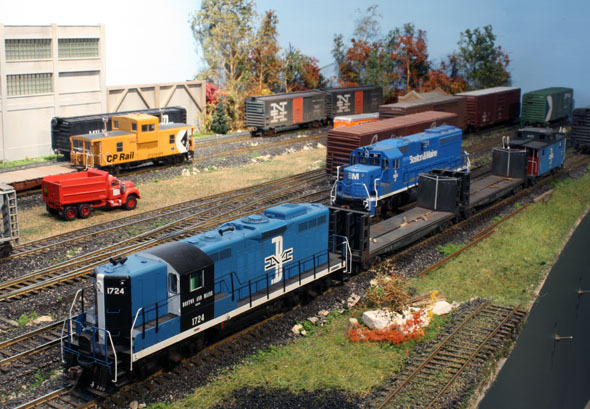 In a post of June 30/17 I outlined our trip to take in the second annual Rapido Trains dealer open house. 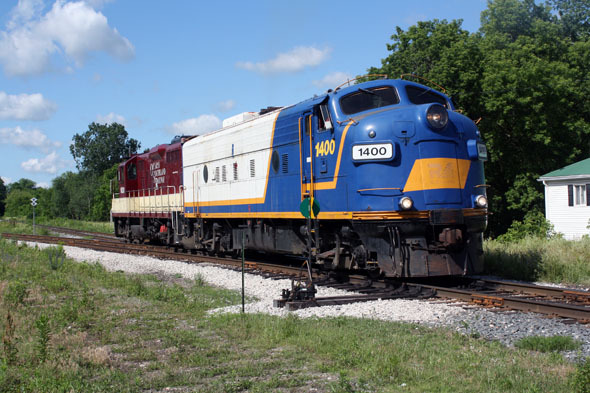 Mention was made of how the morning was devoted to railfan photography, although few of these images were actually included with the story. The purpose of this current post is to rectify that photo shortage. 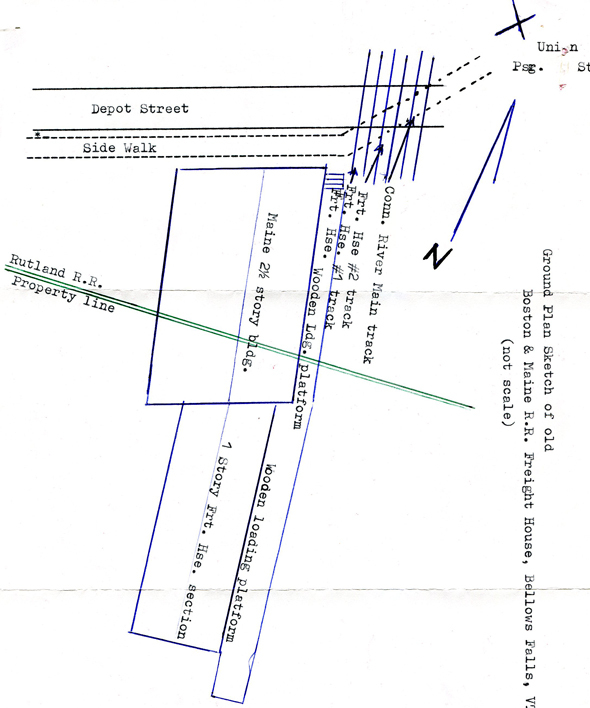 When we left George's house, we headed for the junction in Ingersoll between Ontario Southland's St Thomas sub and the Port Burwell spur which comes north from Tillsonburg and Salford. On my previous visit I had encountered the St Thomas road switcher working the yard shortly after 09:00. It had been ordered at Salford for 08:30, so we were hoping for a repeat of this situation. However, upon our arrival, the small yard was empty - we were to learn later that the St Thomas job had reverted to a noon hour departure from Salford. 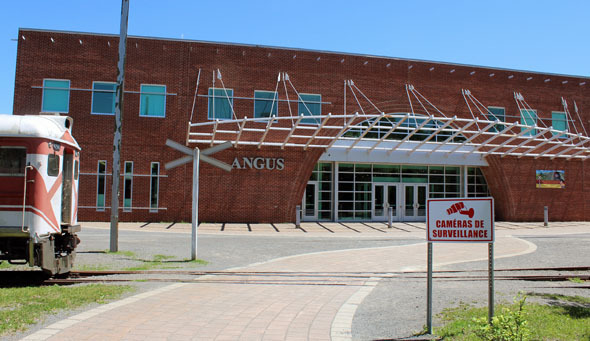 Option B was to head to the Ingersoll VIA station on the CN Dundas Subdivision. 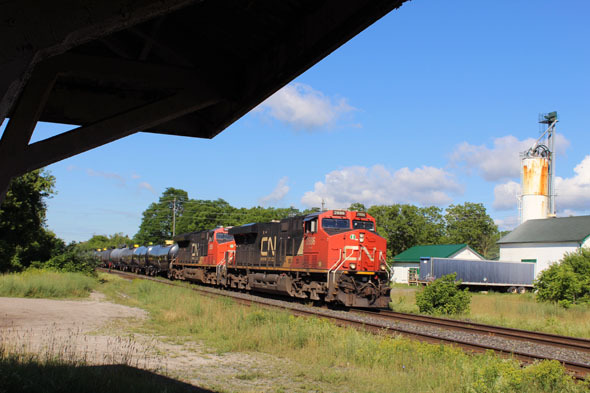 We decided we could watch for CN freights while we listened for the OSR power to come rolling through south Ingersoll. This time our strategy worked out; we caught an eastbound CN freight and still were able to return to the junction to meet the OSR power arriving from Salford. The stars of today's show would be FP9Au 1400 (ex-VIA 6303/CN 6539) and GP9u 1620 (ex-CP 1620/8659). 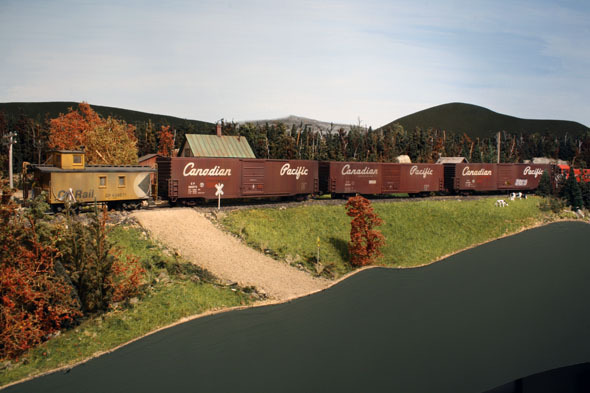 According to the crew, the power would run light to the Cami plant, then the train would head straight to the CP Woodstock yard. The OSR power has just come off the diverging route and is now heading west the short distance to the wye near the Cami auto plant. The units are basking in the morning sunlight as they wait on the east leg of the wye. 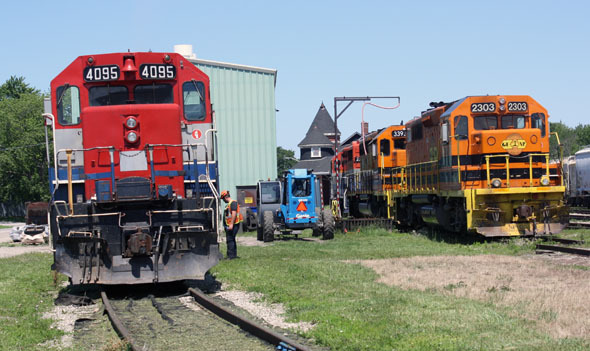 At the Cami plant, the two units waited for a short time on the east leg of the wye while the pair of SW1200RS "pups" working the Cami yard put the finishing touches on today's train. The crew detrained at the level crossing, giving us a chance to get updated on OSR goings-on. We decided to try to catch the train at a few locations between Ingersoll and Woodstock, so we moved on to our first location, the station name board at the east edge of Ingersoll. With minutes to spare, we made it to the overpass at Beachville, then it was on to Woodstock. OSR crosses the double track CN Dundas sub on a diamond at Carew, and this became our next photo location. We followed the train up to the Woodstock CP yard, but the light was fairly axial at this location. 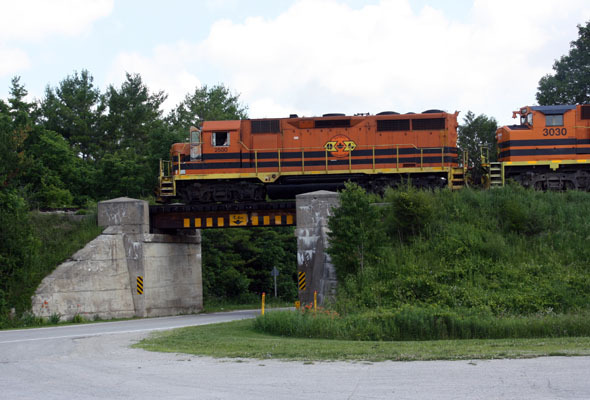 Our next stop was to be in the Guelph Junction/Campbellville area, but no train movements were in evidence during our visit. 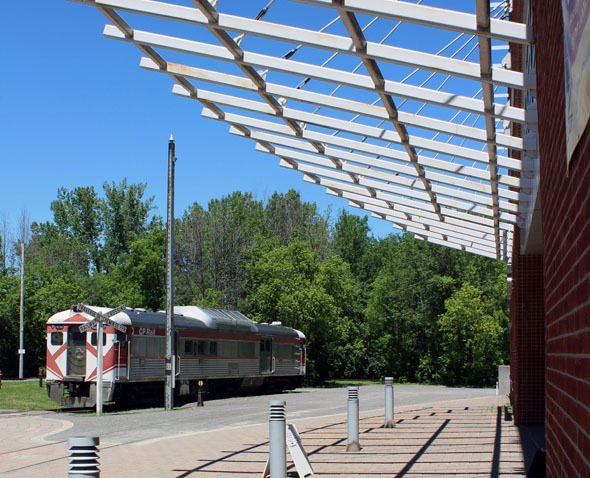 Our last railfan stop of the day was at Chris Hadfield Park in Milton, where we wished to photograph the former CN Milton station. Then we were off to Markham to visit Rapido Trains and take in the day's second major component. A number of scenic overviews of the St Thomas subdivision are available between Ingersoll and Woodstock. We arrived in Beachville just in time to grab this shot west of the main intersection. 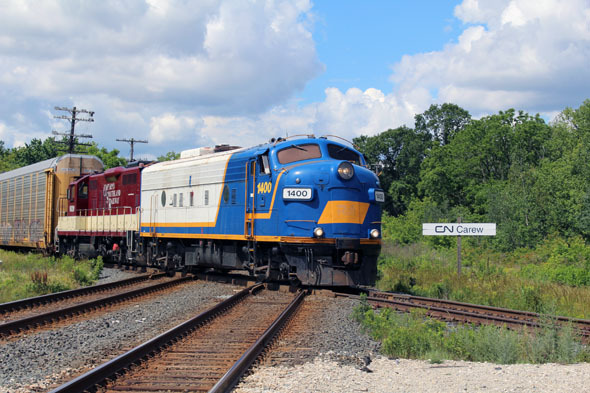 CN Carew is a great spot to watch (and listen to) the train as it arrives in Woodstock. Chris Hadfield Park in Milton is a quiet oasis at the western edge of the GTA, and home to the former CN station. 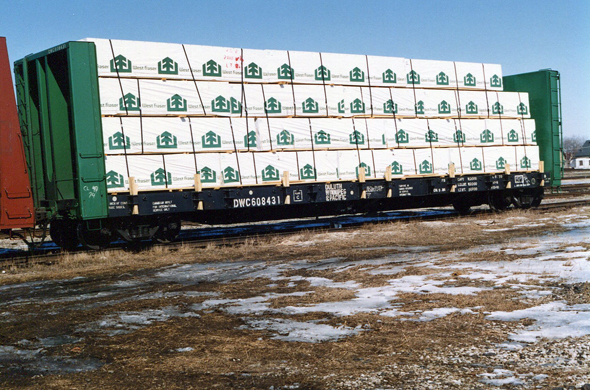 A trio of CPAA International of Maine boxcars are seen on the WRD. 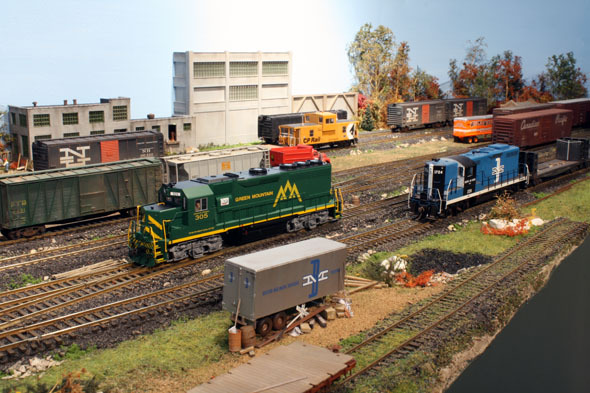 The middle car is my Robin's Rail model while the other two are Peter's Walthers models. On Peter's model the International of Maine was painted over. 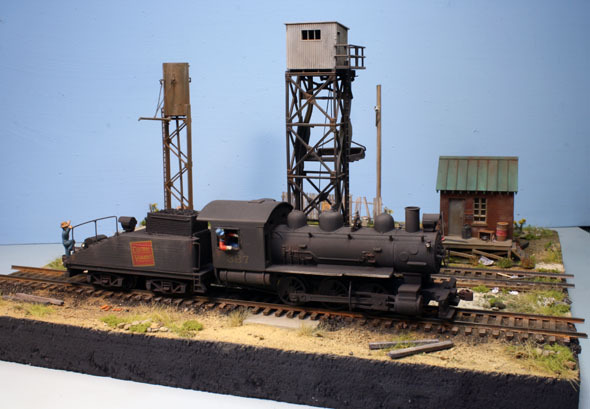 Peter purchased his two models already weathered and detailed. 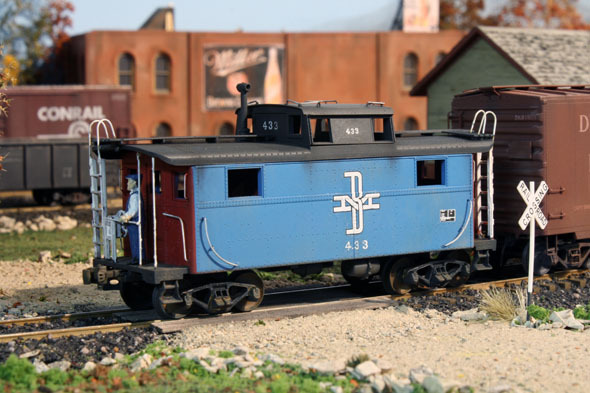 We are thinking the modeler used photos to complete his models. Other versions are seen below that can help one with other options. In the evening one can capture the station and lighthouse above. A beach side view of the ex-CP station which has been totally restored. As one can see most of this eveing customers are taking in dinner on the patio. A wonderful sunset will be happening in just over an hour. 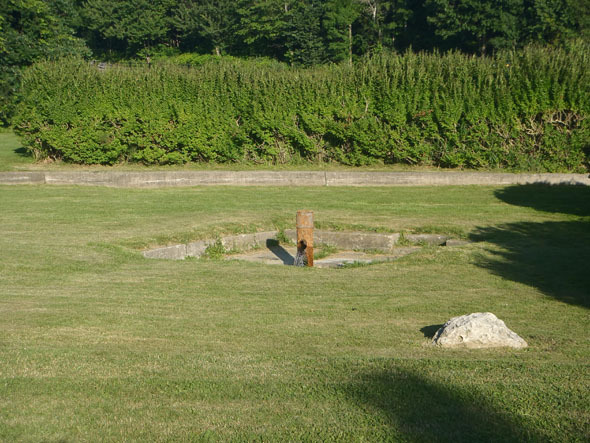 The location of the old CPR water tower near the location of the old station site. 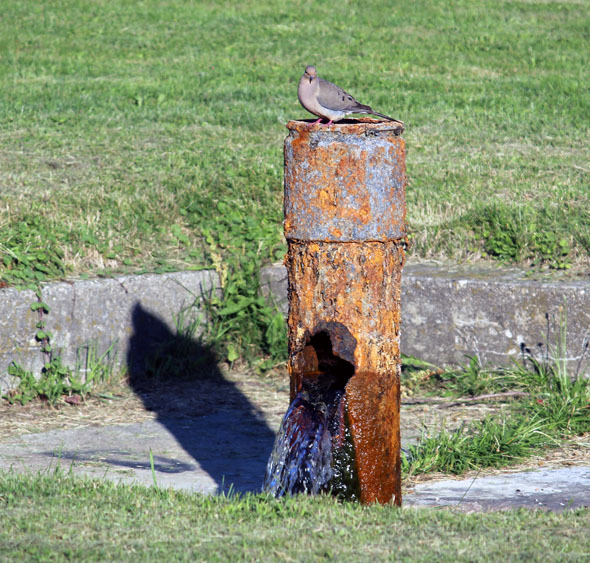 A dove is seen on the water tower stack which still today flows with spring water. Looking across the basin one can see a string of GEXR traffic salt cars next to an awaiting freighter. Oh in the foreground is a catalpa tree in full bloom. Not a common tree for around here...Peter will fill you in later about these big leaf wonders. Peter Mumby photo in London, Ont. Feb 25, 2001 Highbury London, Ont. Peter Mumby photo. 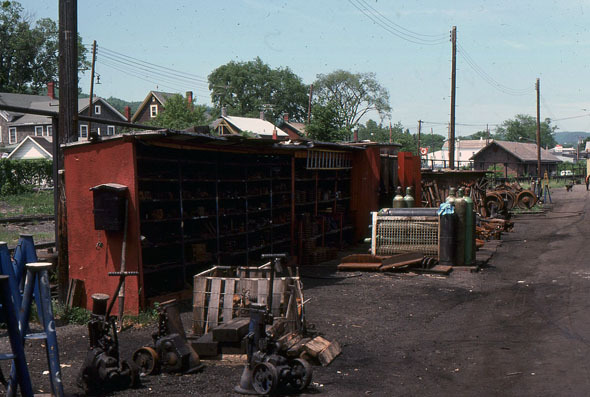 What one saw in the yard at Whitehall, NY., May 23, 1977 Gord Taylor. 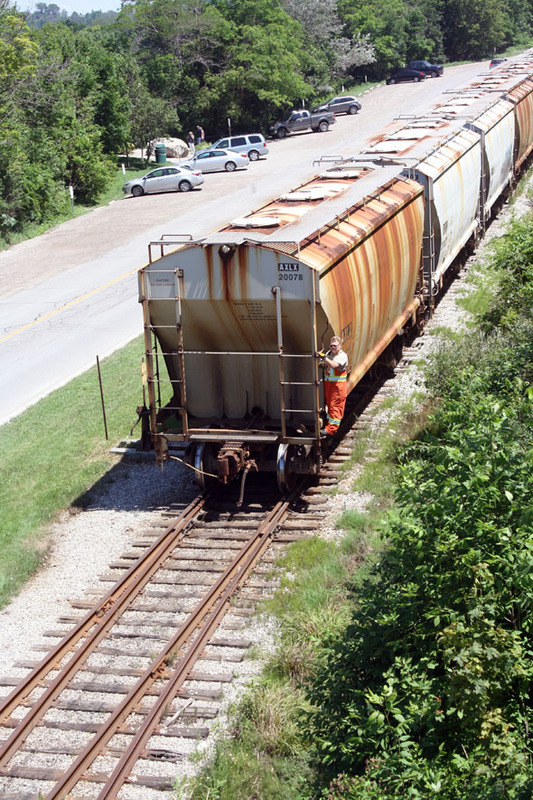 ex-B&M Hoppers in London, Ont.